We hold expertise in offering a comprehensive range includes of Laboratory Water Bath such as Constant Temperature Water Bath and Serological Water Bath. 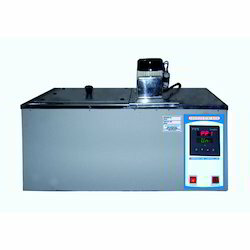 Constant Temperature Water Bath is mostly used in Medical, Educational Institution, Bio-Chemical Industries, Research laboratories and various other industries. This has a double walled construction, and its inner chamber is made of stainless steel and outer chamber made of mild steel. They are fabricated using premium quality materials that are tested for their durability. We export a wide range of Water Baths that are manufactured with the latest technology.